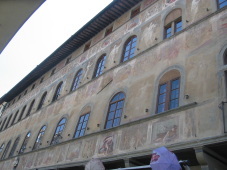 Murals on the outside of a building near S. Croce church, somewhat faded. S. Croce basillica - the photographer is titled, not the church. 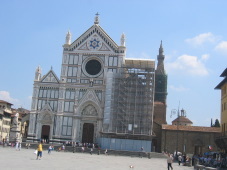 Note that this church, like everything in Florence, is under construction. 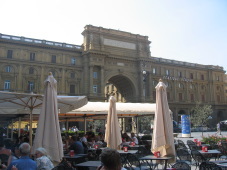 The vivi firezne guide to florence has a complete description of the church and piazza. The outdoor courtyard at S. Croce. 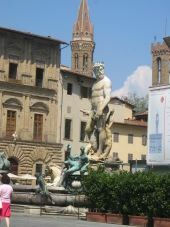 The magnificent fountain and statue of Neptune in the center of Florence. It is found in the Piazza della Signoria, and is the work of Bartolomeo Ammannati, who created it from 1563-1575. The Arno River runs through Florence; there are many lovely bridges over the river, most famously the Ponte Vecchio, from which this shot was taken. 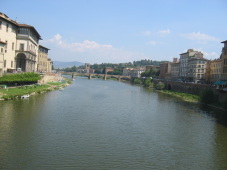 The Estrucans used the River Arno as far back as the 8th century B.C., and dominated the river passageway from Florence to Fiesole, a hill town about 8 km away. 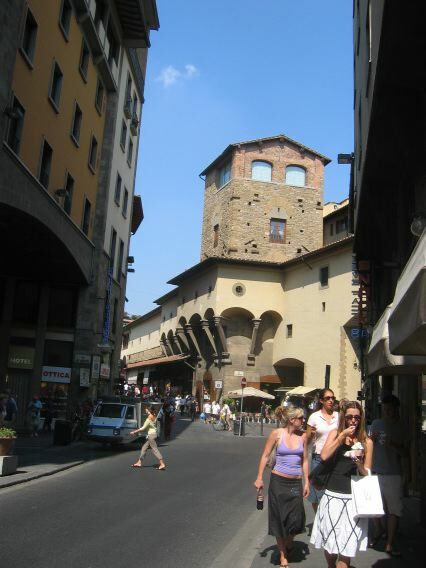 The Estrucans were probably originally from Africa, and settled in Tuscany until conquered by the Romans in the 1st century B.C. You can still see a lot of Estrucan ruins around Tuscany. Hmmm. Some interesting architecture, and some girlberries. It was hot in July/August: usually around 33 celsius (but not humid.) I drank at least 3 liters of fizzy water a day. 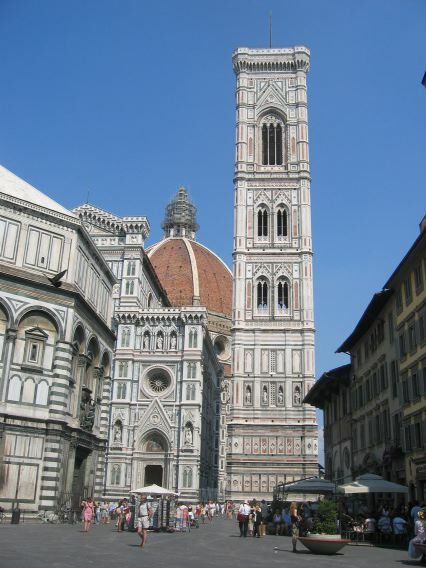 Il Duomo, or the Cathedral of Florence. 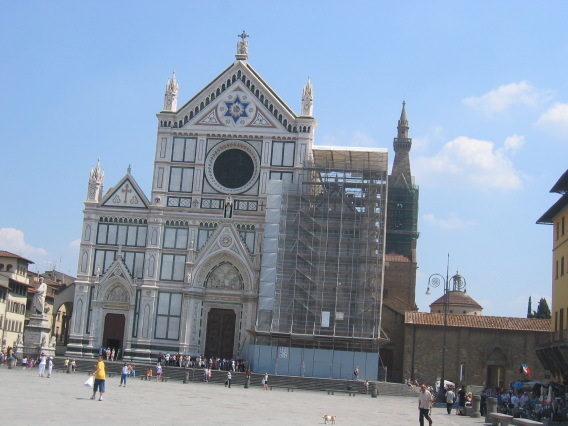 This might be the largest basilica in Italy - don't know about that - it is surely the largest in Tuscany. Florence is the capital of Tuscany, incidentally. What you see here is part of the basilica and dome, and the bell tower. 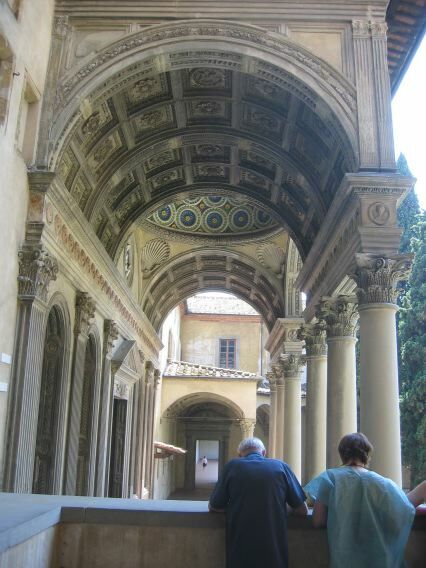 I never got around to climbing the dome or the bell tower; the lines were long and I didn't feel like waiting in line. Bad of me. The Cathedral was started in the 13th century and they've been working on it up to the 19th century (or up to today, since it's under constructin.) 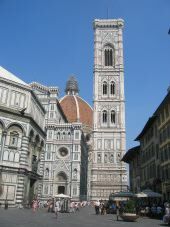 The Florence Art Guide provides a great history and lots of details about this magnificent church. This is where I went to Mass on the first Sunday I was in Florence. 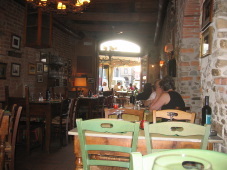 Where I had lunch - or was it dinner - Za Za Ristorante, near S. Maria Novella and the train station. Highly recommended.